I've been trying to emerge from hibernation and get out to see some trains. Here's a few that I've seen so far in April 2015. I went out before noon to the CN Rivers subdivision. 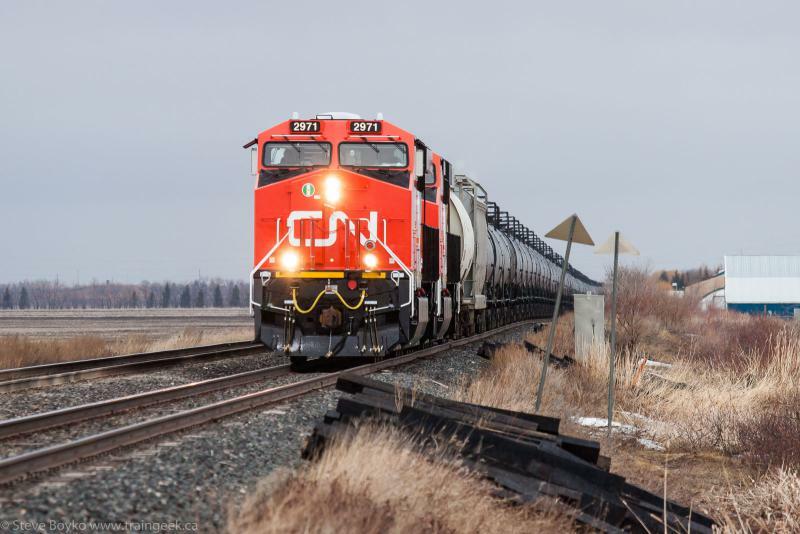 I immediately saw a westbound container train, so I drove ahead of them to Charleswood Road to capture the first photo. There's a little parking lot there so it's easy to park without getting in anyone's way. 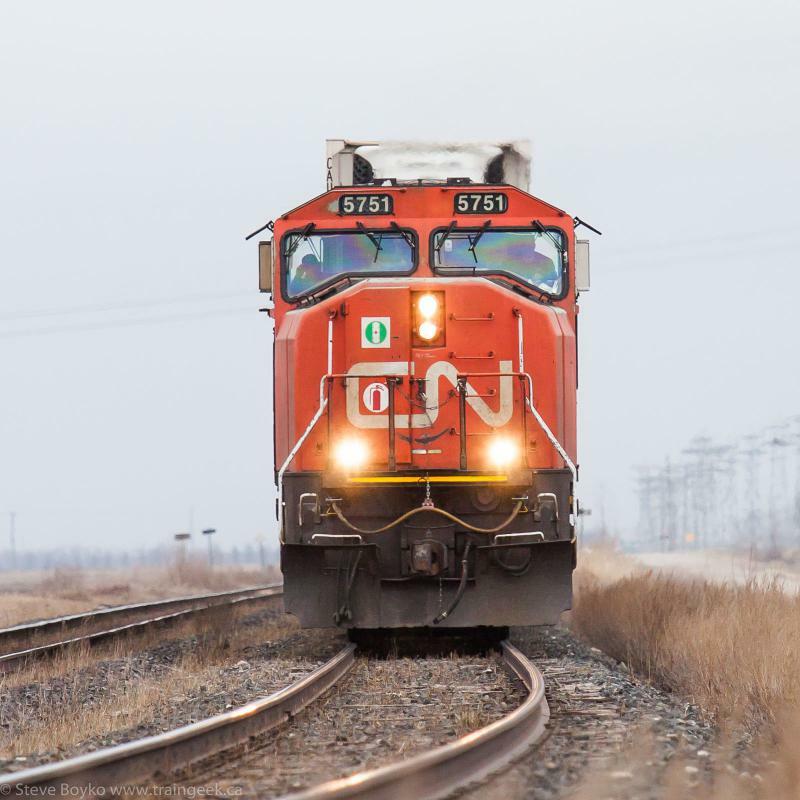 After CN 5751 and CN 5602 rolled by, I gave chase. I decided to try something a little different and went out to mile 16 of the Rivers sub. Here the track bends slightly to head west, so there is a chance for a head on shot without standing between the rails (a very bad idea). I parked and found a place to hop across the water-logged ditch to wait for the train. Then it was just a matter of waiting. I took this shot as the train approached, then moved farther away from the tracks and gave the customary wave as the train rolled on by. It looks like the train was really close, but it wasn't. Here's how it looked in Lightroom before I started cropping and doing the editing. You can see I cropped quite a bit out. My kingdom for a longer lens! 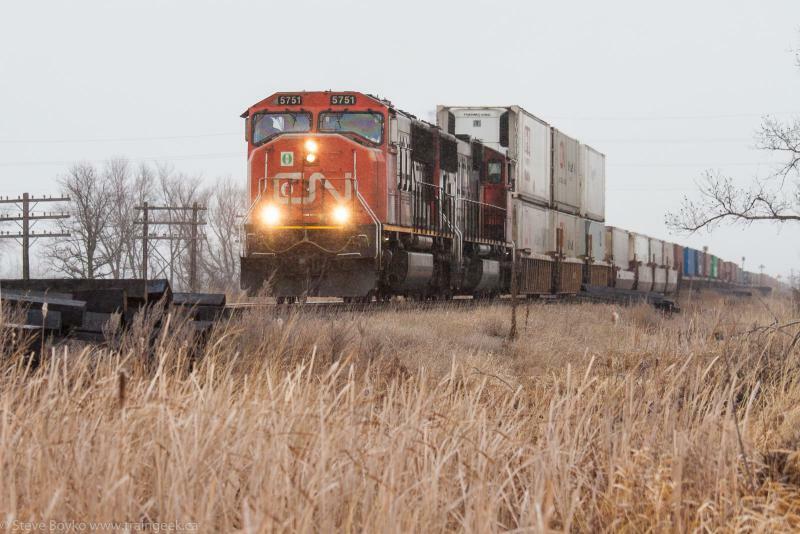 I started heading back east toward Winnipeg when I spotted another westbound train. I went back toward Diamond to get ahead of it. It was an oil train headed by shiny new CN 2971 and CN 2970, train U735 I'm told. I thought that was going to be the end of it, but they were slowing for a signal at Diamond. I went to the road crossing just east of the diamond to take a few photos of the stopped train. We went out after supper on April 3rd. This time I went over to the east side of Winnipeg. 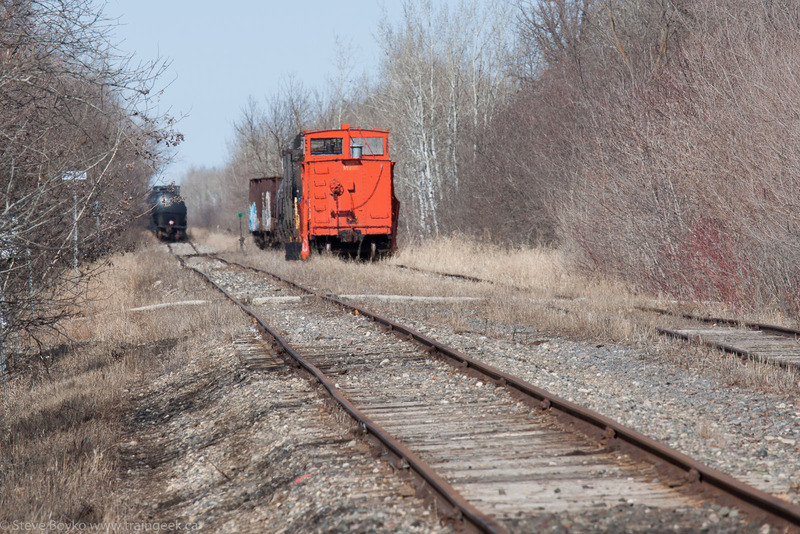 I spotted a train heading into Winnipeg on the CN Sprague subdivision, so I went to Deacon's Corner to catch them at the crossing there. You can see there was a bit of a flurry going on. I spotted an interesting car in the consist so I went to Tinker Town to capture it. The head end was already by but the car in question came into view. AEX 5126 was lettered for the Georgia and Clinchfield Railroad, part of the Family Lines System, which became the Seaboard System briefly before becoming CSX. The herald says "SCL/L&N Georgia Clinchfield West Point Route". 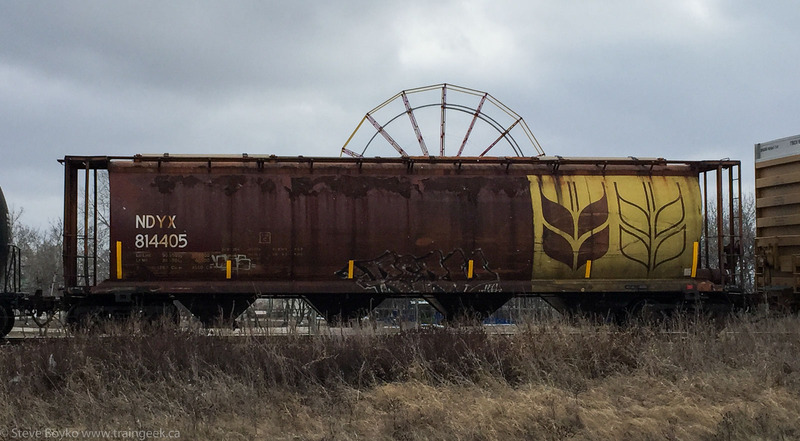 I also noted a few ex-Canadian grain hoppers that have been relettered. For example, NDYX 814405. I normally don't pay a lot of attention to rolling stock but I did for this train. Note that the above two photos were taken with my iPhone 6, mainly because I was too lazy to change lenses on my Canon and I wanted to see how the iPhone did. It took both a regular and an HDR version of each, probably noting the dynamic range of the image between the bright sky and the dark rolling stock. It did an OK job although there are parts of the sky that are still blown out, even in the HDR verison. In my editing, I basically brought the sky exposure down some, brightened the shadows, and added a bit of clarity... and of course cropped it. 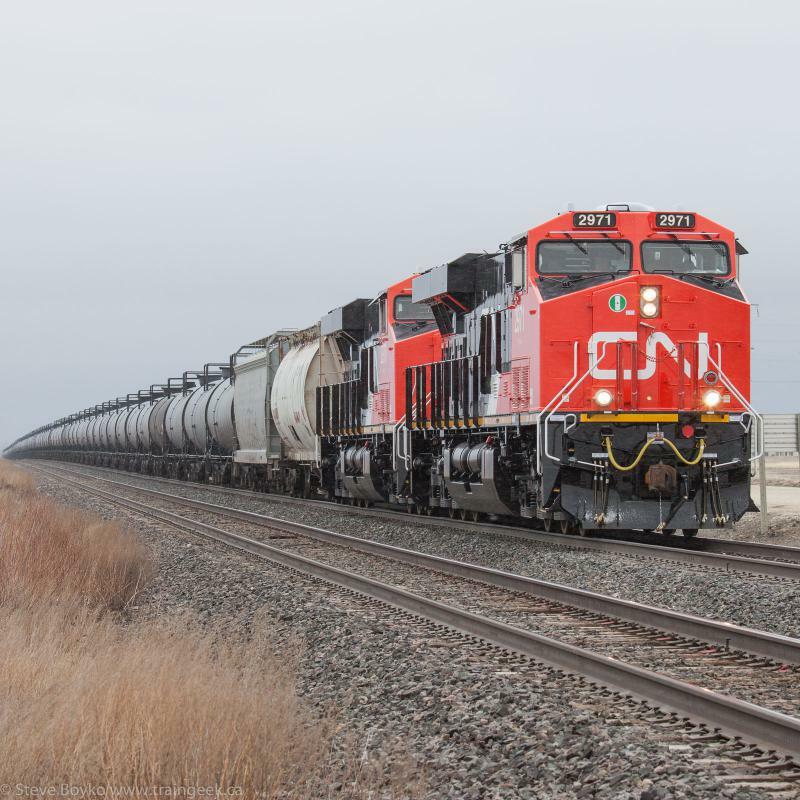 I carried on around the Perimeter to Transcona, where I noted a westbound train parked in the CN yard there. 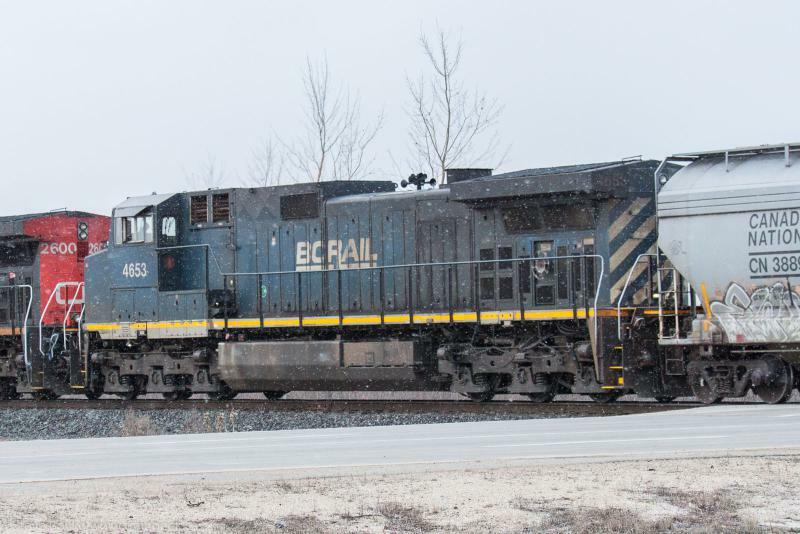 It had CN 2606 and blue BCOL 4648 for power but did not appear to be going anywhere. I took a photo of each but they're nothing special. I carried on to CEMR's shops on Day Street. There I spotted a few locomotives outside their shop, and I was glad to see CCGX 4202 there in the new Cando Rail Services scheme. This was the first time I'd seen it in person. You can see that the flurries were still going on. There was no action on CP so I headed back south on the Perimeter. 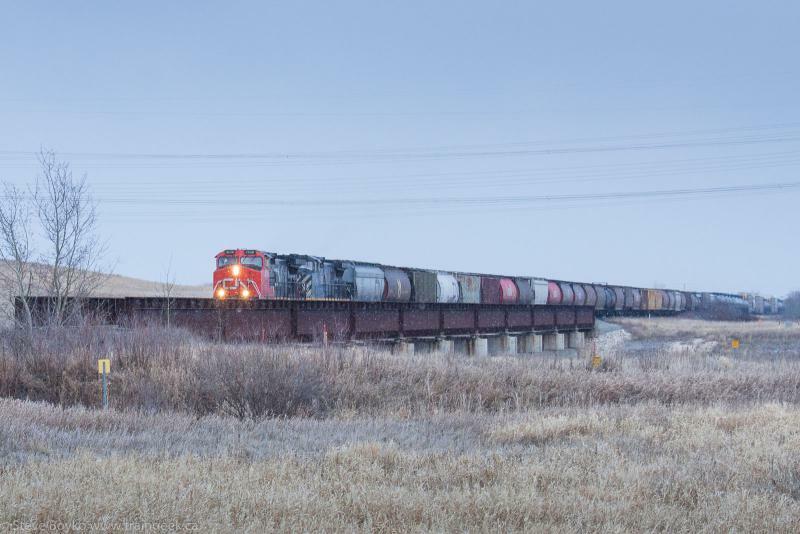 I spied a westbound train coming in off the CN Redditt subdivision, so I got into position to photograph them coming off the bridge over the Floodway just east of the Perimeter Highway. 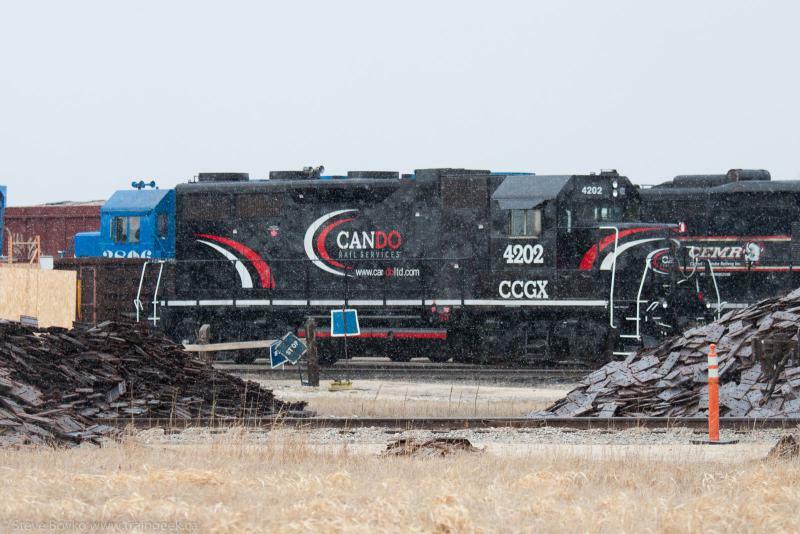 CN 2600 was followed by another blue BC Rail unit, BCOL 4653. By this time the light was getting iffy, so we headed home. We had an errand to run near Symington Yard, so I had a quick glance at Symington on the way by. There were quite a few CN engines there as well as a yellow Railserve locomotive (see this post for the only Railserve I've photographed). 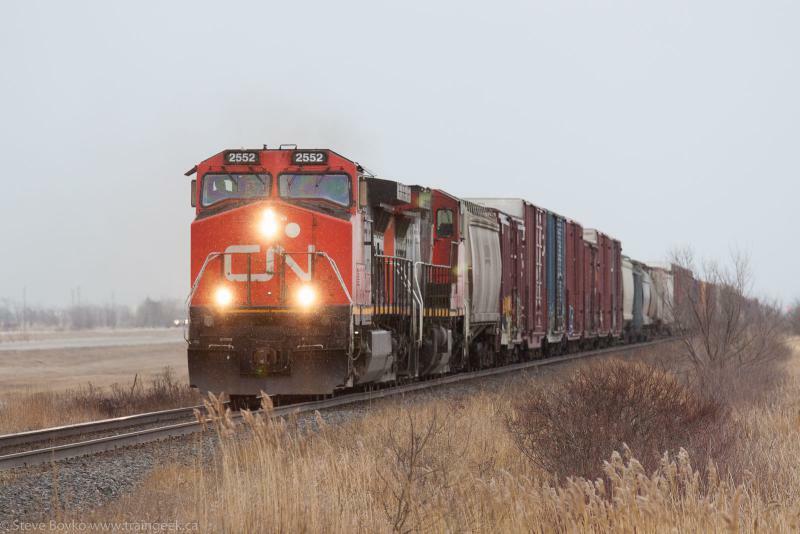 I continued up Lagimodiere and made my way to CEMR to try to get a better shot of 4202. Unfortunately there were no locomotives visible at all. I decided to follow the CEMR Pine Falls subdivision up to see if there was any action, and also because I'd never visited the first few miles of it. You may recall I saw the part of it from Selkirk to Pine Falls, now removed. I drove up to the Imperial Oil facility, which had a lot of tank cars around, but it's not very approachable so I didn't take any photographs. I did spot a snowplow parked on a siding (Manlius, mile 10.2) just north of Imperial Oil. That was CEMR 2, an ex CN plow built in September 1930. There were a few MOW cars coupled to it. Note the tank cars sitting on the main, a clear indication that this is being used for storage. I decided to circle around Winnipeg via the Perimeter, so we headed west. 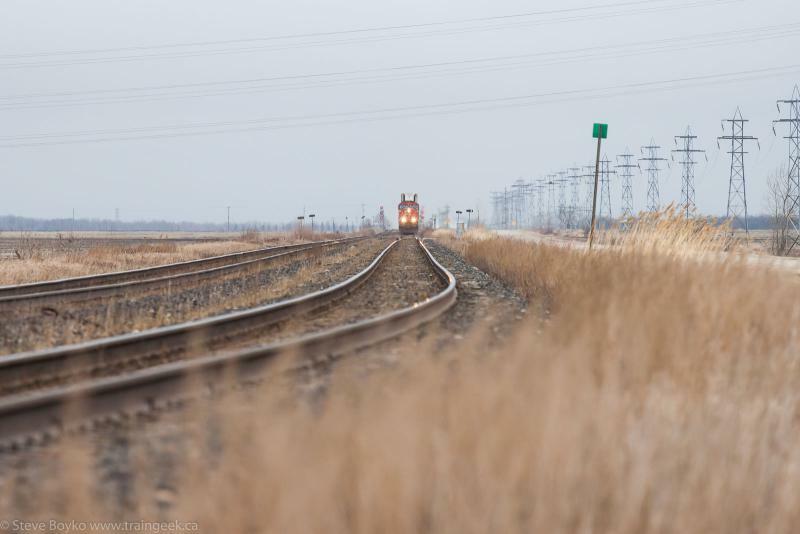 After passing the Prairie Dog Central, I spotted a westbound CP train that turned out to be a rail train with CP 3085 as the sole power. 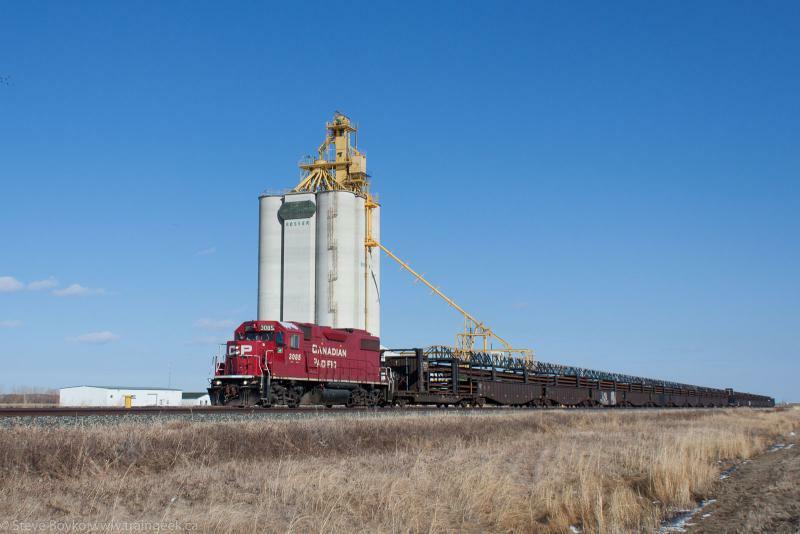 I decided to shoot them at the Viterra elevator by the Perimeter Highway. They gave me a nice toot on the horn as they passed. 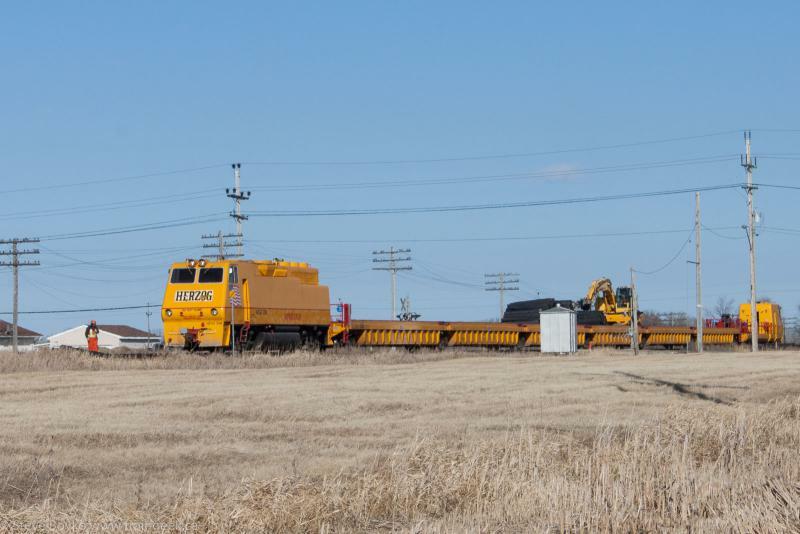 Heading down south, I spotted a Herzog machine dropping new ties off on the CN Rivers subdivision, so I had to capture that. It was HZGX 206 and train at work. 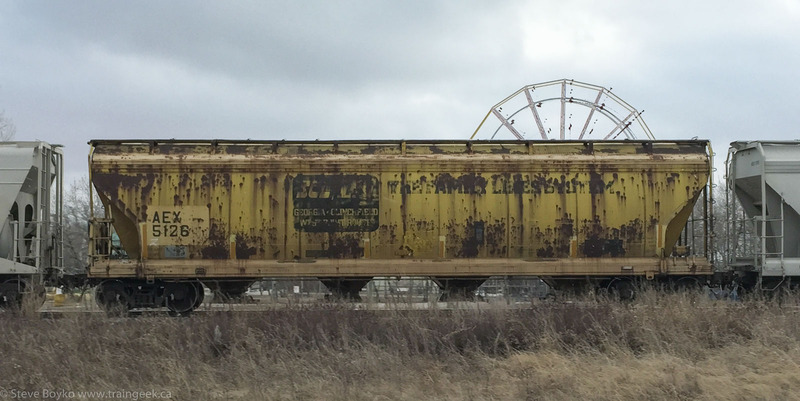 They were crawling west at a slow walking pace, while the operator was picking a bunch of ties up and dropping them on the north side of the tracks. I saw the south side already had ties placed. I saw HZGX 185 back in early 2011 not far from this location. That was the end of three days of railfanning. I hope you've enjoyed reading about them! Steven: Thanks for the tour around Winnipeg and vicinity. Glad you liked it, Bryan! Thanks for commenting. Great post, Steve! We are all emerging from the 'bunker' or basement or just plain indoors after one heck of a winter! 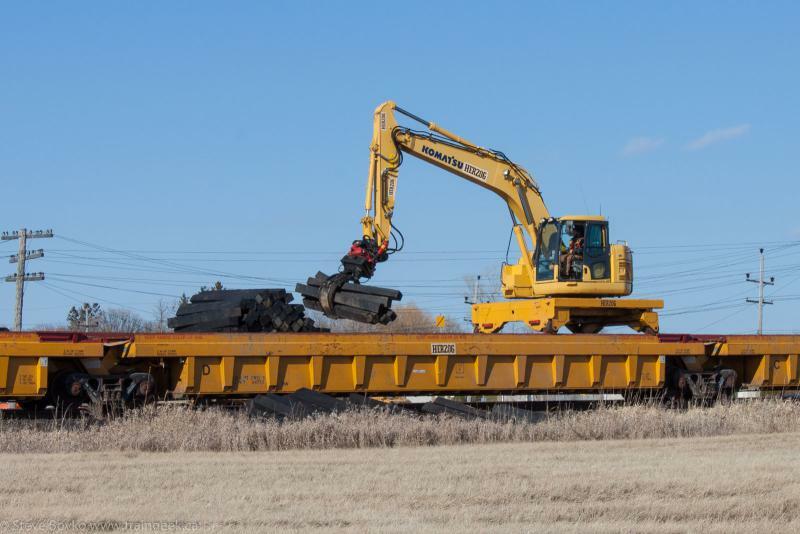 Like Michael Hammond over on The Beachburg Sub, bring on spring railfanning!